There’s been an explosion of new gravel bikes lately. You’ve probably noticed it too, but it’s a good time to be a gravel loving cyclist. Whether you’re looking for an entry-level rig with legitimate chops, a racy, light rig for decimating the pointy end of your races, or an adventure touring rig, you’ve got a lot of good options these days. With three sets of bottle bosses and built in bosses on the top tube for a bento box, the True Grit is well equipped for long gravel rides. 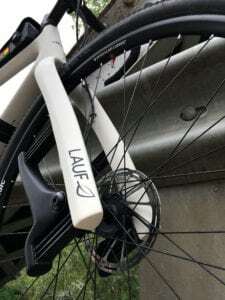 One of the new bikes it seems everyone is talking about right now is the True Grit from Lauf. It’s the first complete bike from the Icelandic company better known to-date for its leaf-sprung carbon forks. Like many high end offerings today, the True Grit is built from carbon fiber, and it’s hard to imagine it being wrought from any other material. The organic shape and boxy, yet flowing lines inspire long looks, while the massive bottom bracket, tall chainstays and short headtube suggest efficiency and power transfer are high priorities. Lauf’s Grit SL suspension fork uses a unique leaf spring design to offer 30mm of active travel. The fork eschews hydraulic damping, instead relying on the progressive flex properties of the military-grade S2 glass fiber leaf springs to control the travel. Geometry for the True Grit is long and low, overall. 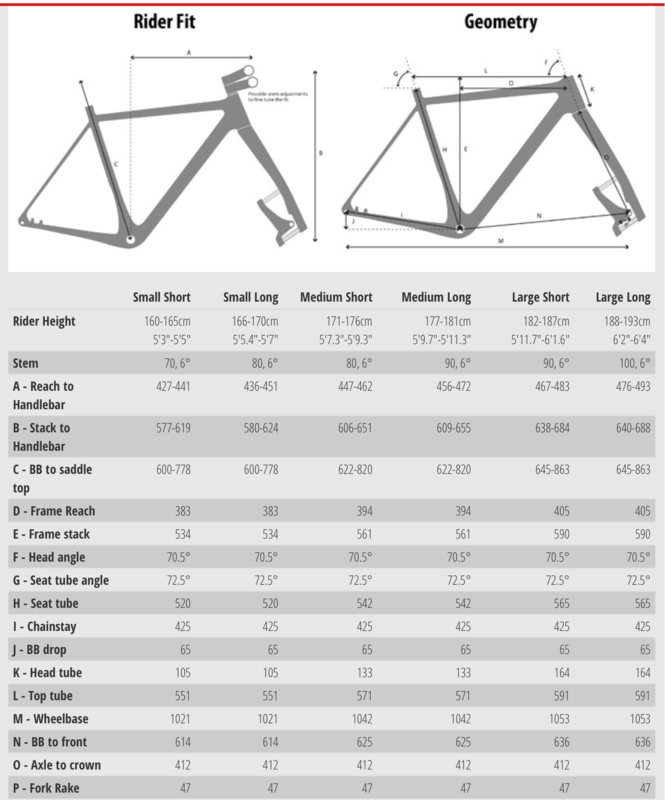 That said, the bottom bracket drop is 5-10mm less than many of our favorite gravel bikes, so it’ll be interesting to see how it plays out here. The True Grit features geometry that’s long and low, with relatively slack angles that should promote a sense of stability at speed. Most riders will end up running a shorter stem on a True Grit than they’d run with many other bikes due to the generous top tube. We’ll discuss this more in the next installment of the review, but fit is one issue we’re still getting dialed in on the True Grit. Lauf offers the True Grit as a frameset for $2,690, or complete with one of three available build kits, most of which are based around SRAM 1x drivetrains. The “Weekend Warrior” build, which features a SRAM Rival 1 drivetrain and HRD hydraulic disc brakes, retails for $3,690, while the “Race Edition” features a SRAM Force 1 drivetrain with lighter DT Swiss wheels retails for $4,990. At the top is the 2×11 SRAM Red eTap-eqipped “Race Wireless” edition, which retails for $6,590. 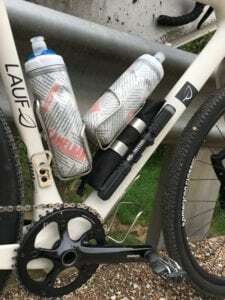 The True Grit is compatible with 1x or 2x drivetrains, however the only front derailleur that works on the bike is an eTap wireless unit from SRAM. 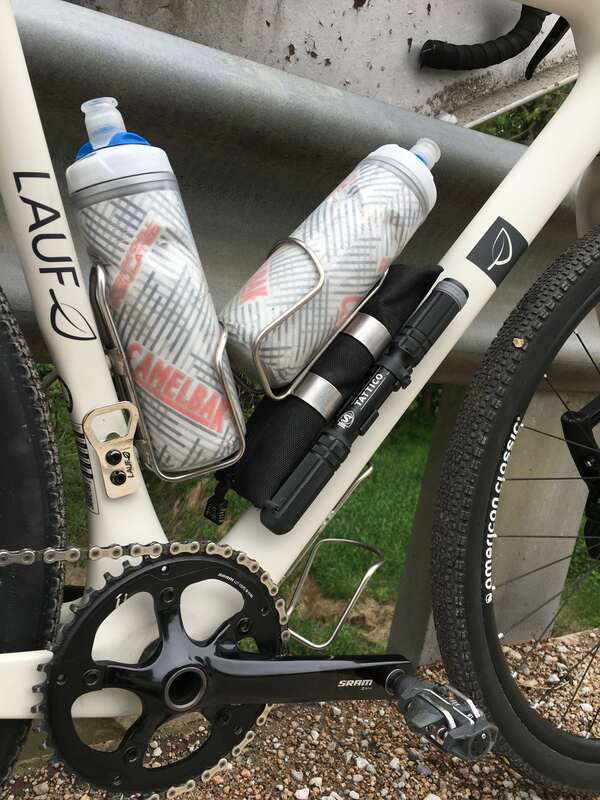 1x riders get a bolt-on bottle opener Lauf calls “Beer or Gear”. Our test bike is equipped with the “Weekend Warrior” build kit, but if you look closely, you’ll see American Classic wheels, as opposed to the DT Swiss wheels specced. When American Classic when out of business a while back, Lauf switched its spec to DT Swiss wheels, but apparently our test bike was built before that switch occurred. Early Impressions It’s clear the folks at Lauf have a clear vision for the bike they want the True Grit to be. Fast, stable, versatile and light are four adjectives that immediately jump to mind. The aggressive stack and reach measurements suggest the True Grit is designed to deliver an aggressive, racy ride, which is good for many of the roadies making the switch to gravel. That said, the lack of an extra-large size will make fitting the True Grit to anyone taller than 6’2″ a bit of a challenge. The Grit SL fork looks different because it is different. The axle is suspended by a dozen small S2 glass fiber leaf springs that offer 30mm of bump-smoothing travel. While the look of the fork is unique, our initial rides have shown it to feel a lot like a very smooth traditional fork. It’s transparent in operation, but the benefits of the suspension are easy to feel when the going gets rough. 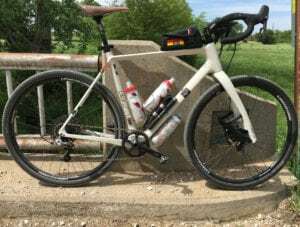 I’ve had several fellow cyclists express skepticism about the need for suspension on gravel rides, but there’s very little downside in the Grit SL. Yeah, it’s heavier than a rigid carbon fork, but the ride quality is significantly better as well. The True Grit will be getting a thorough workout over the next few months. 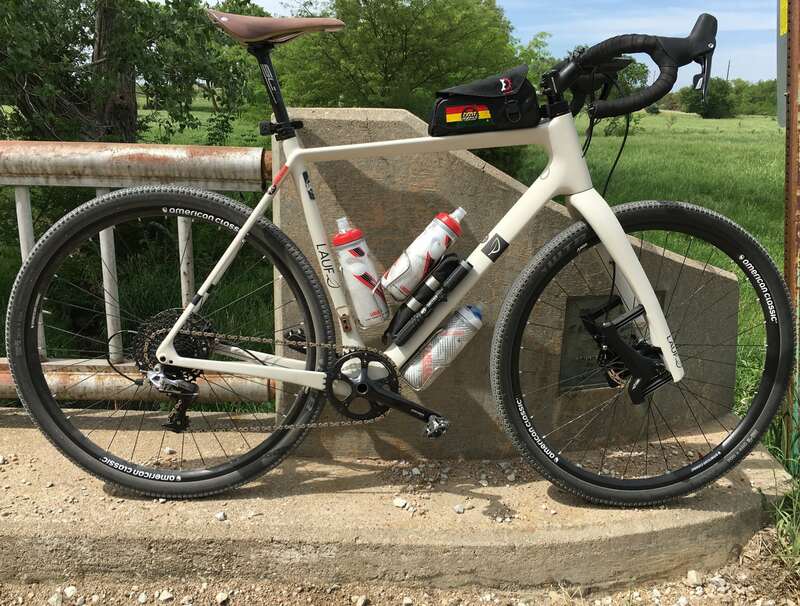 We’ll be riding and racing the bike in a number of events, including the Loess Hills Enduro, Solstice 100 and Gravel Worlds, among others, to see how it works on a variety of different gravel conditions. Look for more detail on the handling and ride quality of the True Grit in our next installment of the review. We’ll also discuss the changes we’re making to the bike in order to get the fit dialed, so stay tuned for that review to come about one month from now. Learn more about the True Grit on the Lauf website. 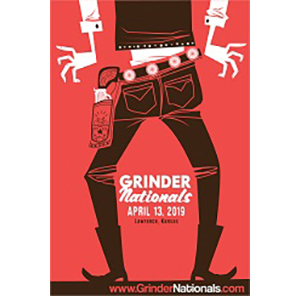 Now get out and ride your bike… It’s gravel season, folks! 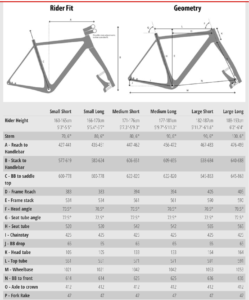 Note: Lauf sent over the True Grit for test and review at no charge to Riding Gravel. We are not being paid nor bribed for this review and we strive to give our honest thoughts and opinions throughout. The leaf springs are made of fiberglass, not carbon fiber. The Lauf folks explained this during their presentation at the Dirty Kanza expo. Thanks @Richard Bayer. Edit made. I appreciate your attention to detail. Are you looking at getting onto a Lauf? @MG I’ve been on this bike for several months now. I recently raced the Lauf True Grit at the Wilmington Whiteface Mountain Bike Race. I was using WTB Resolutes on I9 wheels. I ended up 9th out of 69 in my age group and earned a spot in the 2019 Leadville 100 MTB. I think you will find the bike very capable in a variety of surfaces and conditions. My bike is set up with a Wolftooth 38 chainring and a e 13 9-46 cassette. I’m looking forward to hearing your long term impressions of the bike. Enjoy!